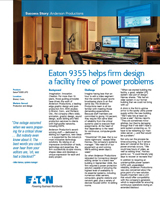 When the company relocated its design/editing center to a brand new building suffering from spotty utility power supply, the firm required a power protection solution capable of ensuring the highest level of availability to its essential systems, including numerous video servers, computers, graphic station and editing rooms. Since implementing the 9355, post-production house's operations have remained constant. The UPS kicked in twice in its first five months of operation, when power glitches struck the post-production facility. When Anderson Productions started building their new facility, a good, reliable UPS system was part of the design. The firm realized that the spotty utility power supply in the new building can result in time-consuming restarts of the main video systems and possible loss of video and editing hours. The post-production company required a reliable UPS that was compatible with their generator and at a good price point. The 9355 enhances the firm's peace of mind. "The 9355 is doing everything we were hoping for...In fact, it's already done it twice now," says the system manager.